Blur's gig at Blackpool's Empress Ballroom in Blackpool had to be halted on Wednesday when a barrier in front of the stage gave way. The collapse was apparently triggered by a mosh pit which formed during the second song, There's No Other Way. Fan Lidia Facchinello said: "The barrier fell forward right in front of us. Loads of people started having a go at the staff fixing it." 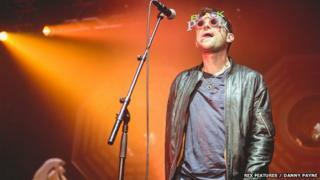 Singer Damon Albarn then stopped the song and asked fans to step backwards. He explained the barrier was faulty, and safety had to come first. But, after another attempt to restart the song, the band left the stage all together. There was a 10-minute delay while the barrier was repaired. When the band returned to the stage, Albarn apologised, saying: "Sorry about that. At least it won't collapse now", before playing Lonesome Street, the opening track on group's new album The Magic Whip. The singer was clearly annoyed with the situation and could be seen shouting instructions to members of the stage crew during the next few songs. The gig lost momentum due to the stoppage, but Blur turned it around with a second-half which included career-defining hits such as Parklife, Song 2 and Girls & Boys. New songs including Ong Ong and Go Out were particularly well received. At the end of the 23-song set, Albarn apologised once more, saying: "Thanks again for your patience at the start. "It's the worst thing that could have happened. Well, unless something had happened." Blur continue their warm-up tour tonight at Llandudno, before headlining The Isle of Wight festival on Saturday.